● The capital of Maharashtra is one of the co-hosts of the world’s largest theatre festival, held in India for the first time, organised by the National School of Drama (NSD), New Delhi. ● Mumbai will play host to 28 performances from 24th March to 7th April 2018, presenting a diverse range of theatre forms from all over the world. ● This edition of the global theatre festival will cover 17 cities in India with over 25000 artists performing 450 shows, 600 ambience performances, and 250 youth shows. Upholding its long association with theatre, the financial capital is all set to shine under the spotlight as one of the co-hosts of the 8th Theatre Olympics, world’s largest theatre festival, being held in India for the first time. The Mumbai chapter of the 8th Theatre Olympics is organized by the National School of Drama (NSD) in collaboration with the Directorate of Cultural Affairs, Maharashtra. The rich culture of Marathi and other languages theatre offers a perfect backdrop to Mumbai as one of the co-hosts of this global theatrical extravaganza. The city is known for its traditional values and aesthetic sense of performing arts. Therefore, Mumbai boasts of a sizeable theatre loving population who may take this chance to experience a variety of folk, national, and international productions. The mega event will provide the people of the state to catch a series of 28 stimulating world class performances, including 8 specially invited plays from renowned theatre maestros including “Mohe Piya” (Waman Kendre), “Sonata” (Sohag Sen), “Rashmakirathi” (Ravishankar Khare), “Phera” (Soumitra Chatterjee) and 8 international productions including “Shri 420” (Saba Zaidi and Atul Tiwari, Australia), “Almost Alive” (Sabine Molenaar, Belgium), “Xuan Zang’s Pilgrimage” (Wang Ziangyun, China). Mumbai will also host an international seminar on dwindling popularity of theatre that may be attended by renowned playwrights such as Thomas Stoppard, and popular actors M K Raina, Arundhati Nag, and Dev Shankar Halder. “Art has been the earliest form of communication and nothing gives an artist more delight than performing in front of an audience that appreciates art, no matter from which part of the world they come. In a way, theatre is a great equaliser and unites people of multiple cultures and traditions under one umbrella. We are extremely proud to bring the world’s largest theatre festival to India. During this 51-day long nationwide celebration of the 8th Theatre Olympics, we attempt to bridge the borders across countries through the call of theatre and engage in creating a global village,” says Dr. Arjun Deo Charan, Acting Chairman of National School of Drama Society. 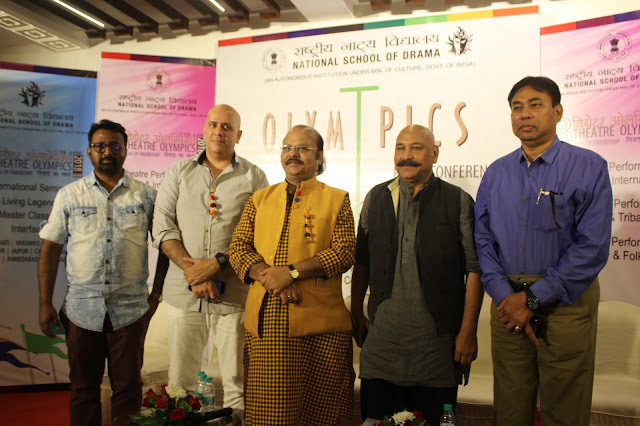 “For the past 3 years we had the dream to bring Theatre Olympics to India. The dream that we had seen has come true. Since we began to envision and achieve this feat, Dr. Mahesh Sharma and the Ministry of Culture have extended wholehearted support to the idea and have played an instrumental role in making it a reality. Throughout centuries we have seen playwright like Shakespeare and Bertolt Brecht becoming a part of Indian theatre, while despite having our own extraordinary playwrights and theatrical figures, we are still to make similar impact. This is a huge leap towards that direction of putting Indian theatre on the world map. We should be proud of our theatre legacy that is more than 2500 years old,” says Prof. Waman Kendre, Director, National School of Drama. The city will witness the culmination of the festival on 8th April. The Theatre Olympics was established at Delphi, Greece in 1993. The Theatre Olympics presents some of the greatest theatre practitioners from around the world. It is a platform for theatrical exchange for students and masters, where a dialogue despite ideological, culture and language differences is encouraged. So far, the Theatre Olympics has been held seven times in the following countries: Japan (1999), Russia (2001), Turkey (2006), South Korea (2010), China (2014), Poland (2016). The theme of this edition is “Flag of Friendship”.